Check out STE(A)M Truck from the perspective of these young makers. "I want to teach kids to build stuff... I want to help people." "I want to be an engineer." "It's about sharing your ideas with your friends. And teamwork, definitely teamwork." In the video below, Janelle describes her Big Build. The Big Build is a final project for the students, one where they get to delve into a build and see a larger-scale project from beginning to end. Her bubbly personality brought a real energy to STE(A)M Truck. One of the first builds that Janelle encountered with STE(A)M Truck was the Brick Build. Students worked in crews with a Maker Mentor and were given various challenges. Janelle and her team built the second tallest brick tower, applying their knowledge of post and beam structures. Janelle was especially proud of the snake mascot that they built during their final challenge. A few days later, students were challenged to create a structure that would support a person and span a kiddie pool full of water... using only cardboard and duct tape. "I learned about the strength of a triangle and how using triangles in bridges makes them stronger." says Janelle. Janelle's class was then presented with five options for their Two Day Build. She chose to do Stop Motion Animation. 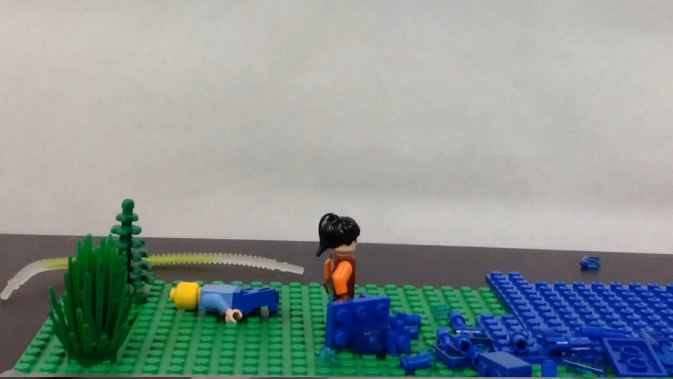 She and her group created their very own LEGO Movie style animation. "It tricks your brain into thinking that still pictures are actually moving!" He is interested in becoming an engineer when he's older, he hadn't considered engineering prior to STE(A)M Truck's visit to his school. When he and his class did the Cardboard Bridge Build challenge he got really excited about the science behind everyday structures. Given a choice of five different STE(A)M related activities, Lamar chose to learn about and create his own stop motion animation during the Two Day Build. He and two of his classmates made their very own wild west themed short film in less than an hour. The next part of Lamar's time with STE(A)M Truck was the Big Build. The Big Build is a five to seven day project that allows the young makers to invest themselves a little further into a project. Lamar and his group made a variety of candy products from scratch, branded them, and sold them at STE(A)M Truck's science-fair-style Share Day. "It's about sharing ideas with your friends. And teamwork, definitely teamwork." One of the first activities that Ariyae participated in when STE(A)M Truck came to her school was the Brick Build. Students work in teams to complete a variety of challenges using 100 bricks. When asked about the Brick Build a few days later, it was clear that she saw right to the heart of the activity and said, "It's about sharing your ideas with your friends. And teamwork, definitely teamwork." All STE(A)M Truck activities are centered around our core competencies such as collaboration, perseverance, and curiosity. For her Two Day Build, Ariyae chose the Toy Hack. She worked with one of our Artists in Residence to reimagine some old toys in new and interesting ways. The project is about form and structure, fine motor skills, and a creativity. When asked why she chose the Toy Hack over the other options, she replied, "Because I like to express myself in art. I knew that if I chose the Toy Hack then I could express myself through the art I create." Given an opportunity to chose a second Two Day Build, Ariyae found another way to express herself through her art, this time with some math incorporated into the activity. With one of our Maker Mentors and a few classmates, Ariyae created an original tessellating mural in the style of MC Escher. This activity required precise measurement, spatial thinking, and again, a good dose of creativity. With not only a creative drive, but a business mind as well, Ariyae chose do the DIY Candy Making Business for her Big Build. In this build, the makers made a variety of candy products from scratch, branded them, created packaging, and sold them at the STE(A)M Truck Share Day. For each activity that makers participate in during their time with STE(A)M Truck, they have the opportunity to earn a badge. Ariyae earned the Change Maker badge with the DIY Candy build. "We learned about the changes in matter. You have syrup and sugar and water. When they're mixed you can't get them back to their original state. And we made change when we sold our candy!"